On Wednesday, the Environmental Protection Agency (EPA) issued its list of top greenhouse gas emitters from 2010. Of the top 100 emissions sources, 96 were power plants, virtually all of them coal-fueled. The EPA recently developed new air emissions standards to curb pollution. This follows a 2007 U.S. Supreme Court decision that ruled greenhouse gases can be regulated under the Clean Air Act. This week's report will provide more ammunition for the EPA to move on air quality standards. But the EPA is not just targeting carbon dioxide levels. As I have discussed previously, new interstate air standards focusing on mercury, nitrous, and sulfurous oxide emissions will likely have a more immediate impact on coal's prospects in generating electricity. Even without a renewed EPA push, coal's prospects were diminishing. Even though it remains the cheapest fuel for power production on average, the environmental impact looms large. And then there are the enormous reserves of unconventional gas that will capture portions of coal's market share. The sources are primarily from shale basins, but they also include the rising production of coal bed methane and tight gas that have exploded onto the market in the last several years. This gas largesse has put the cost advantage of coal into perspective. 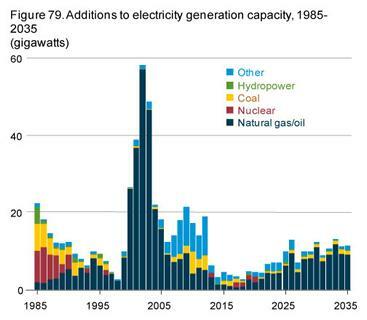 With that gas supply now guaranteed, and the price differential between the two fuel sources narrowing, there are few genuine prospects left for renewed interest in building either new coal-fired plants or even co-fueled ones (that could make use of both coal and gas). The advent of some tax incentives and government subsidies will result in a few coal-to-liquid (CTL) plants. But despite the PR push from the coal industry, CTL is not a cost-effective solution once the umbilical cord of public sector money is withdrawn. All of this is happening at a pivotal point in the development of the national grid. And that is why investors need to understand what it means for the future of both coal and natural gas. Back in late September, I addressed a meeting of Western power-company executives held in Pebble Beach, Calif.
One of the slides I presented to them tells us everything about the future of coal and natural gas. The EPA's non-carbon standards could easily add an additional 20 GW to that total. My current baseline estimate is a projection of 30% to 35% of additional natural gas use in the power sector within the next eight years. This is why those EPA mercury, nitrous, and sulfurous oxide standards are rather significant. They require a 90% cut of mercury and a 52% reduction in nitrous oxides by 2015, along with an 80% cut to sulfurous oxides by 2018. I am projecting that additional major coal-fired plants in 17 states will be affected. Republican candidates and Congressional leadership are arguing that the EPA standards – both carbon and non-carbon – will hurt corporate development and employment, as well as lower the prospects for ready energy essential to a continuing economic recovery. Yet, the balance of analysis indicates that the replacement of coal with gas will not result in any major dislocations on a national level. Of course, the case regionally is quite different, which is why most areas adversely hit will probably end up seeing existing major power plants grandfathered by legislative action. That buys time and softens the local blow. It does not, however, reverse the imminent trend. In 2008, Congress gave the EPA explicit instructions to develop stricter standards sooner rather than later. The results of this year's elections may delay that somewhat, depending on the makeup of both Congressional chambers once the political smoke clears. But a reversal of the trend to enforce clean air standards is very unlikely. This has become a global move, with even the heaviest polluter (China) admitting it has a problem and committing to the use of gas over its massive domestic poor-quality coal. Coal will remain the primary choice in Asia (China, for example, must put a new decent-sized power plant on line each week to meet rising power demands). However, coal's market share has been reduced. This is even the case in Germany, where a decision to phase out nuclear plants has placed more emphasis on gas and less on coal. All of this points in the same direction. The EPA report simply reflects the change in direction. The agency is hardly driving it, and the ability to delay implementation of new standards will only delay what is coming anyway. Coal will remain a major power source in the United States. And it is still essential for essential processes like steel production and a range of industrial and heating uses. However, over time, it will not return to its position as the main driver in the electricity market. And investors need to plan accordingly. product that will supress coal gasification emissions. It’s in the startup mode, insofar as I’m aware. A local Mpls. company called the “Collaberation” is supposedly promoting knowledge about it. It’s unclear to me where the government is on this matter. So it remains to be seen whether the emission supressor will eventually go into production–to answer the problem. This analysis leads to an investment theme/ question. Who are the players for providing the utilities with gas power generation? Does Dr. Moore have any companies he’d recommend? congressional district. Do you think after the deflection or defection of Canada from the Kyotol Treaty and other issues related ,Should there not be a health care bill intertwined with all the oil drilling and polution going on? There in the Bakken Formation is another prime example of. No respect foor life the way it sounds. I do not knowif that holds true or not but there are certainly some issues they should be considering. What do you think? spreads and all of the more essential nature areas though. Neither is wind or solar cost effective, especially if Fed incentives were withdrawn. Then what are you going to power your country with? Gas is only cheap, right now, because it is not used in abundance. It won’t be cheap, for long, if everything switches to it. Then what? It will be too expensive to switch back at that point. I saw all of this happen before, years ago, when the plants switched to oil.It was the biggest blunder they ever made. It will be this time, as well, if they switch to gas. The market makes the best decisions. Not bureaucrats.